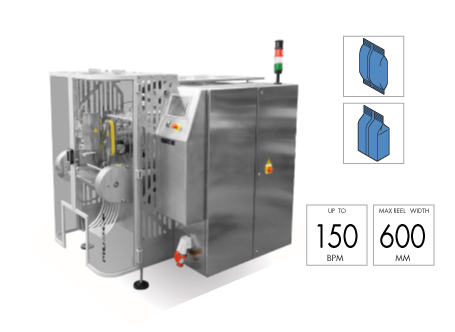 MRM600-I - TARGET Packaging System LTD.
MRM600 is a vertical packaging machine with continuous motion studied for high performances in speed and reliability. Thanks to the special rotary movement of the horizontal sealing jaws this machine meets the needs for large productions of short-cut pasta and snacks as well as granular products, sweets and others. Film traction by a vacuum pump and perforated belts driven by brushless motor. Vertical sealing group by means of a sealing belt (easy to be replaced). Horizontal sealing group composed of rotary sealing jaws driven by brushless motor. Autocentring of the film made by 2 optical sensors.